Black-faced Spoonbill Platalea minor has a very small population. However, its population trend is stable and perhaps increasing. In the early 1990s only a few hundred individuals were known, but by the late 2000s the known population had increased to over 2,000. The January 2016 census recorded a new high of 3,356 birds. 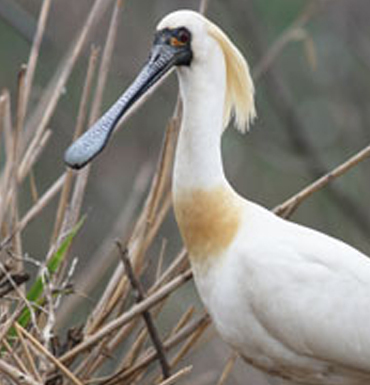 Despite its gradual recovery, Black-faced Spoonbill is still a globally Endangered species with vulnerable breeding colonies and deteriorating wintering sites. 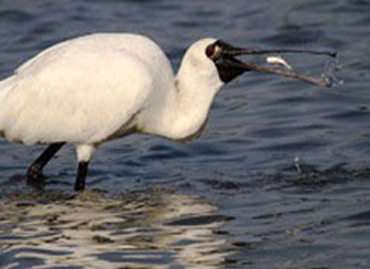 Spoonbills live in coastal inter-tidal habitats, which are threatened by reclamation and pollution in eastern Asia. They breed alongside other waterbird species on small islands from March to August. Breeding success is low. They feed in the early morning or late evening on intertidal mudflats. At other times of the day they rest and sleep on trees, man-made structures or in shallow water within 2-3 km of feeding areas. They feed on fish and shrimp, which they locate by moving their bill side-to-side. Some birds with satellite transmitters have wintered in Hong Kong and Taiwan, migrated along the coast of eastern China to northern Jiangsu, then over the Yellow Sea to the Korean peninsula. During the winter many birds aggregate and sometimes are in mixed flocks with Eurasian Spoonbills Platalea leucorodia. They first breed when they are 5 years age and some live for 9.5 years. Black-faced Spoonbills breed on islets off the west coast of North Korea and South Korea, and Liaoning province in mainland China. It has been reported in the Tumen estuary of Russia, and breeding was recorded in South Primorye for the first time in 2006. In South Korea, the major breeding sites are Ganghwa-do (280 birds), Songdo and Yeongjong-do (100) and other islets in Incheon Tidal Flatand Shiwa Lake (100) and Saemangeum area (80). Since 2006, Black-faced Spoonbills have been visiting and breeding at Namdong Reservoir an artificial island within Songdo city. Approximately 100 pairs of Black-face Spoonbill breed now at this artificial island, but this population is threatened by on-going reclamation on Songdo mudflat. Major wintering sites are the Tsengwen estuary of Taiwan, the Deep Bay area of Hong Kong, and the Chinese mainland and Hainan Island. It also winters in Jeju, South Korea, Kyushu and Okinawa, Japan, and Red River delta, Vietnam, and there are recent records from Thailand, the Philippines, Macau and inland China. The key known stopover sites used during migration include Yueqing Bay, Wenzhou Bay and Sanmen Bay, as well as Chongming Dongtan, Shanghai. Historically the population exceeded 10,000 individuals, which fell to an estimated low of 288 individuals in 1988. 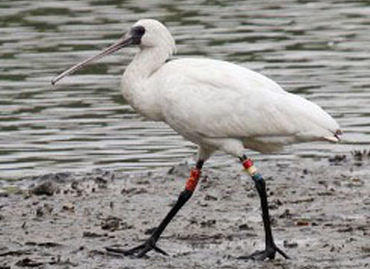 The population appears to have recovered subsequently, with a total of 1,679 individuals counted during the 2006 International Black-faced Spoonbill Census. The 2007, 2008, 2009 and 2010 censuses recorded totals of 1,695, 2,065, 2,041 and 2,347 birds respectively. The population is continuing to increase in January 2016, with 3,356 individuals counted. This may reflect genuine increases and result from successful conservation measures at a number of sites. Some uncertainty remains over whether census increases represent increased survey effort, displacement of birds from unknown wintering sites or genuine population increases. On the basis of on-going habitat loss and degradation the overall population is expected to decline in the near future.